Walt Bellamy Jr. Park is now open to the public following a dedication ceremony during MumFest weekend. Walt Bellamy, Jr. was born in New Bern on July 24, 1939. His childhood home is located just up the street from the new park at 222 Jones St. He was a student at West Street/J.T. Barber High School and became a standout basketball player at a young age. He attended college at Indiana University and was the starting center on the 1960 Gold Medal U.S. Olympic Team. Later, he was first overall pick in the NBA draft in 1961. 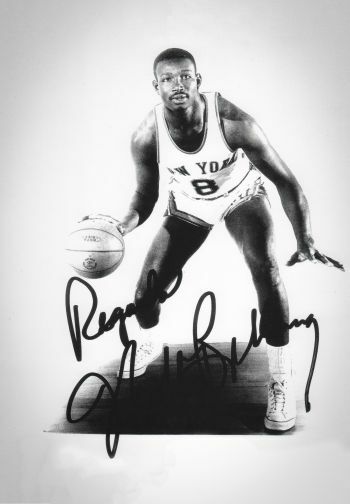 Bellamy had a 14-year career in the NBA, playing first with the Chicago Packers, who later became the Baltimore Bullets. He also played for the New York Knicks, Detroit Pistons, Atlanta Hawks, and the New Orleans Jazz. and was later inducted into the NBA Hall of Fame. He died on November 2, 2013 at the age of 74. Land for the new park was donated to the City in 2014 by Margaret Fulcher. The year before, Pollock Street and the surrounding area became the footprint for the Choice Neighborhoods Initiative (CNI), a program funded through the U.S. Department of Housing and Urban Development (HUD). CNI is designed to help local leaders transform struggling neighborhoods into sustainable, mixed-income communities of choice. The process included planning for the revitalization of the Five Points Area, including improvements to the social, economic and physical fabric of the neighborhood. Creation and development of a park fit in with the CNI plan. The park is a great example of public-private partnership. The City provided $2,250 for the project, which was used to purchase the park sign, concrete for visitor and pedestrian pads, and landscaping. The installation of these elements by city staff was provided in-kind. The Walt Bellamy Jr. Park Committee successfully raised approximately $25,000 in cash donations and in-kind contributions for the project, including a $5,000 grant from the Harold H. Bate Foundation. Carolina East Health System contributed $2,000 and Mrs. Helen Bellamy and family donated $2,100. Visitors to the park will notice a 22-foot sculpture placed atop a mound that anchors the park. Artist Glen Spencer was inspired to create “Reach for the Stars,” a metal sculpture that features a crown of spinning stars. Interpretive, historic panels flank the bottom of the sculpture detailing Walt Bellamy, Jr.’s life and legacy. The park and sculpture are designed to be an inspiration to all ages, especially the young who are often encouraged to reach for the stars in achieving their dreams and goals. We attended the park dedication. Kathy Adolph was great, the sculpture is monumental. It is inspiring!!!! We will be reaching for the stars!!!!! Glen Spencer has done a marvelous job!! !